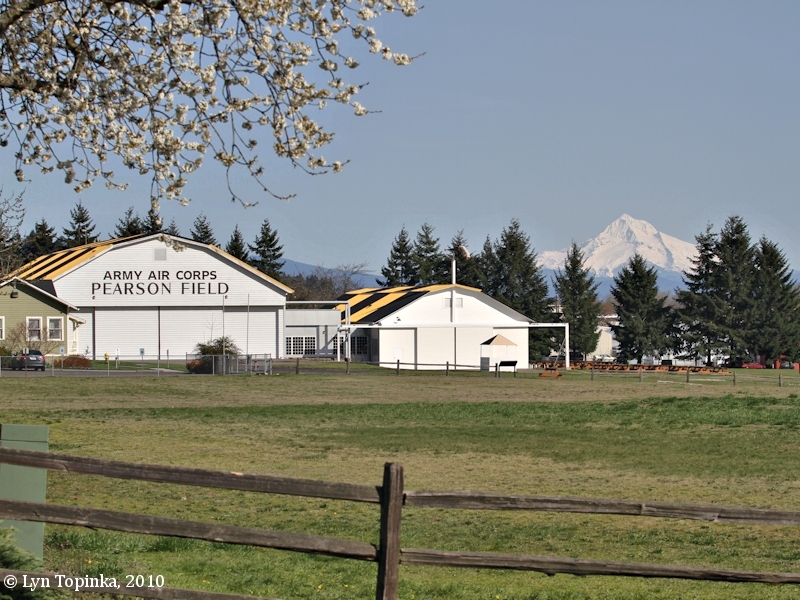 When the U.S. Army came to Vancouver in the mid-1800s, the area south of Fort Vancouver and Vancouver Barracks (known as "Jolie Prarie") was used for ammunition storage, a blacksmith shop and garden. In later years it was used as a polo field. 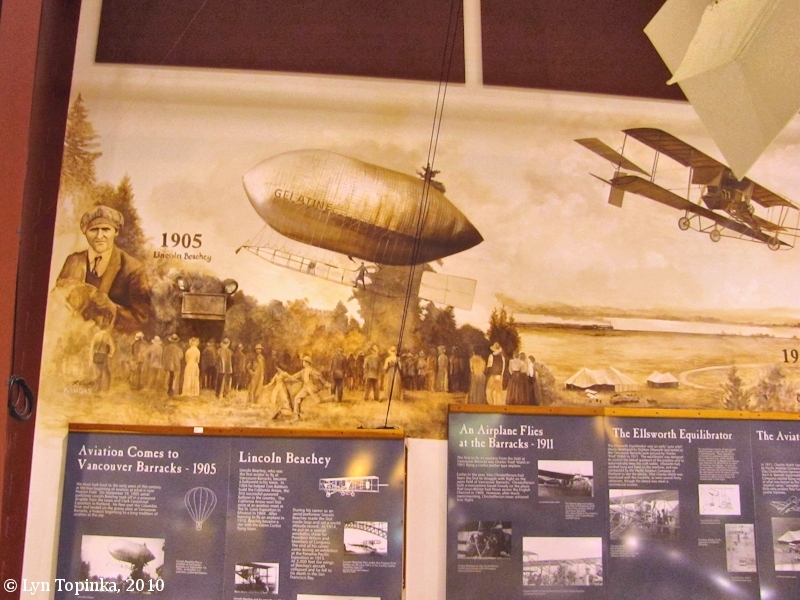 Then, in 1905, one hundred years after the Lewis and Clark expedition, Lincoln Beachey in the dirigible, City of Portland (using the Gelatine airbag) took off from Jantzen Beach, Oregon, during the 1905 Lewis and Clark Exposition, and landed on the polo grounds of the Vancouver Barracks, Vancouver, Washington. This was the first aerial crossing of the Columbia River and marked the beginning of Pearson Field. Today, Pearson Field remains the oldest continually operating airfield in the United States. 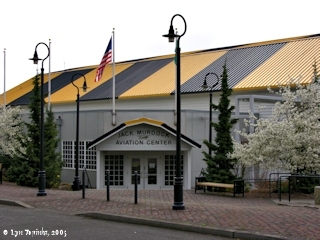 It is also home to the Pearson Air Museum and the Jack Murdock Aviation Center. Pearson Field was named in 1925 after Lieutenant Alexander Pearson, "one of the Army's brightest young pilots", who was killed the previous year. Click image to enlarge Headquarters, Pearson Field, Washington. Image taken March 18, 2005. The first airplane flight at Vancouver Barracks was in 1911 with Charles Walsh and Silas Christofferson flying Curtiss Pusher biplanes used the Army's field as a landing field in order to experiment with various configurations of aircraft. During World War I, the area around Pearson Field was the location of the world's largest spruce cut-up mill, cutting raw timber into lumber used to build the planes which helped win the war in Europe. In 1923 the 321st Observation Squadron was assigned to Pearson Field. Their mission was to teach Army Reserve Officers how to fly, using four Curtiss Jennies and one Dehavilland DH-4 aircraft. One notable aviator assigned to Pearson Field was Oakley Kelly, who, along with Lieutenant John McCready, flew the first non-stop transcontinental flight in 1923. In 1924, Pearson Field was a stopover on the army's first round-the world-flight. On June 20, 1937, Soviet aviator Valeri Chkalov and crew landed there at the end of history's first non-stop, trans-polar flight, a flight which took 63 hours and 16 minutes. Today a monument commemorating that flight is on display just west of the museum. This is the first monument to commemorate a Russian accomplishment on U.S. soil. Over the years, the field was visited by such notables as Charles Lindbergh, Jimmy Doolittle, Eddie Rickenbacker and squadrons of barnstormers. Two occupants of an adjacent commercial field, Pacific Air Transport and Varney Airlines, later joined with two other companies to form United Airlines. Pearson Field was named in 1925 after Lt. Alexander Pearson, "one of the best known and finest pilots in the Air Service." He was killed while preparing for an air race in 1924. During World War II, the field housed Italian prisoners of war. After the war, the airfield was declared surplus by the U.S. Army and sold to the City of Vancouver. 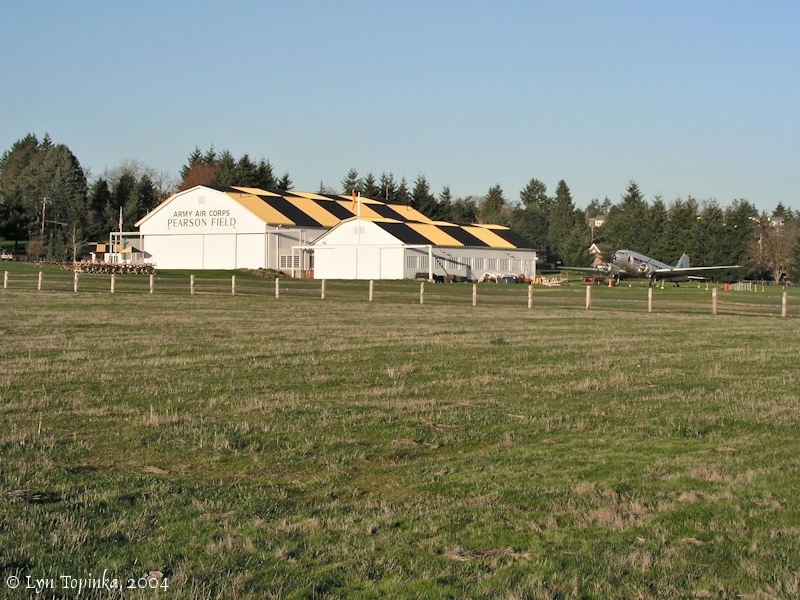 In 1996 the 366-acre Vancouver National Historic Reserve was established to protect important areas of Vancouver's history, including Fort Vancouver National Historic Site, Vancouver Barracks, Officers' Row, and Pearson Field. A portion of Pearson's runway sits on land once occupied by historic Fort Vancouver and now owned by the National Park Service. 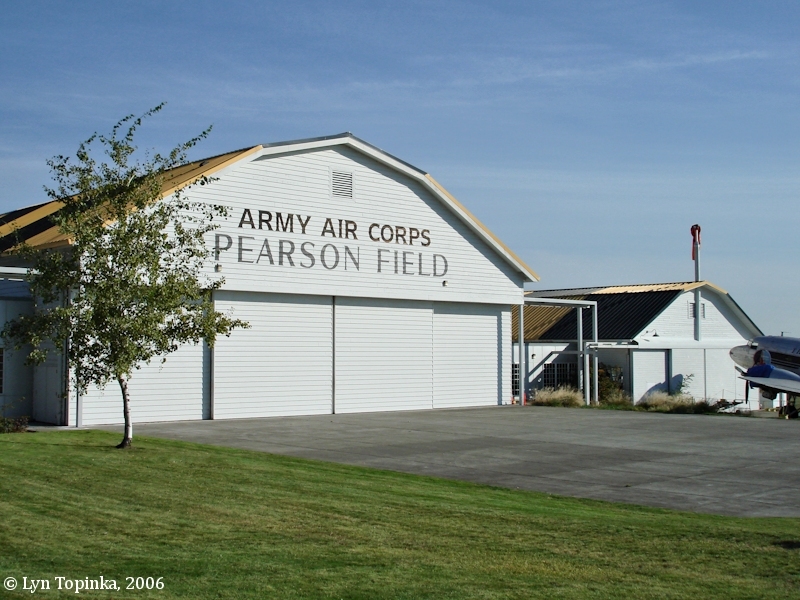 "... PEARSON ARMY AIRPORT, corner 5th and E. Reserve Sts., has hangars, shops, and administraion buildings. Here ended the 63-hour flight across the North Pole made by three Russians who hopped off at Moscow on June 18, 1937, to test the feasibility of air transportation across the top of the world. The Soviet fliers landed at this field because of fog, short of San Francisco, their destination. When asked the reason for their explorations of the Arctic, the spokesman for the trio voiced the feeling that Jefferson had had 150 years before them: "We do not like blank spots on the map.". ..."
Click image to enlarge Mailbox, Pearson Field, Vancouver, Washington.. Image taken April 8, 2017. Three airships were at the Lewis and Clark Exposition; the "Angelus", the "City of Portland", and the "Gelatine". 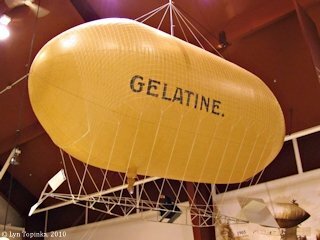 The airships "Angelus" and "City of Portland" were constructed by Thomas Baldwin and the "Gelatine" was constructed by George Tomlinson of New York. The "Gelatine" was sponsored by the Knox Gelatine Company of Johnstone, New York. The "Gelatine" made its first flight at the Lewis and Clark Centennial Exposition on September 4th, with a successful ascent but unfortunately a broken motor forced it to land out of the Exposition grounds. 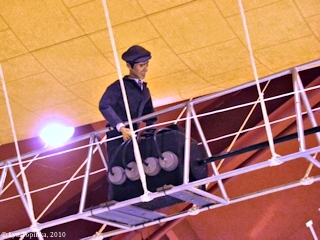 The airship "City of Portland" made 23 successful flights between June and October 1905 at the 1905 Lewis and Clark Centennial Exposition in Portland, Oregon, with flights after early September being the "Gelatine" gasbag fitted onto the framework and motor of the airship "City of Portland". On September 19, 1905, Lincoln Beachey piloted the "City of Portland/Gelatine" across the Columbia River, landing at Vancouver Barracks, Vancouver, Washington, and becoming the first controlled powered flight in Washington State. Source: Bill Alley, 2006, Images of Aviation, Pearson Field, Pioneering Aviation in Vancouver and Portland, Arcadia Publishing. Click image to enlarge Gelatine exhibit. Pearson Air Museum, Vancouver, Washington. Image taken April 1, 2010. Click image to enlarge Pilot, Gelatine exhibit. Pearson Air Museum, Vancouver, Washington. Image taken April 1, 2010. Click image to enlarge Display, Gelatine exhibit. Pearson Air Museum, Vancouver, Washington. Image taken April 1, 2010. The Jack Murdock Aviation Center is located at Pearson Field and focuses on the period from 1905 through World War II, when Pearson Field was the site of many aviation firsts. 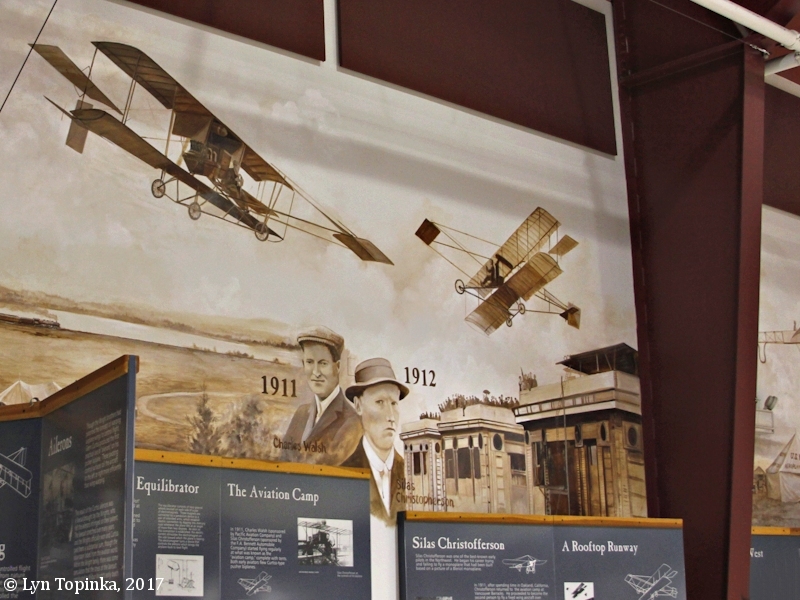 The 23,500-square-foot museum features a pictorial history of Pearson Field and historic artifacts and aircraft. The black and yellow checkerboard roof was common at Army airfields during the “Golden Age of Flight", when pilots often needed visual guides to a safe landing. The museum includes such planes as a 1912 Curtiss Pusher replica, a 1913 Voisin III (one of only three in the world), and a 1941 Boeing Stearman. 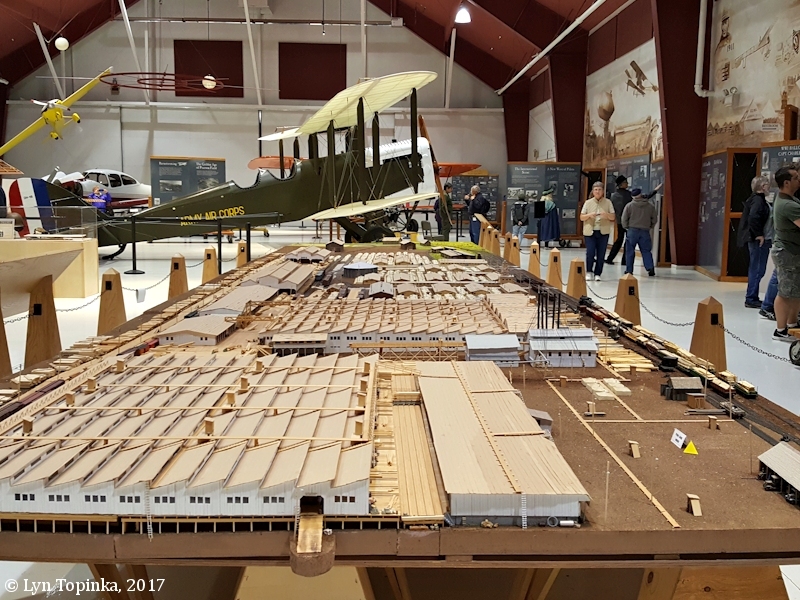 The museum also includes the country's second oldest wooden hangar, built in 1918 as part of the U.S. Army Spruce Division. The hanger has been used as an airplane hangar since 1921. It housed Italian prisoners of war during W.W.II. The Jack Murdock Aviation Center operates as a cooperative partnership between the City of Vancouver and the National Park Service. Jack Murdock was a Vancouver resident, a successful businessman, and a lifelong aviation enthusiast. He is best remembered as co-founder of Tektronix, Inc. and as benefactor of the charitable trust that bears his name. 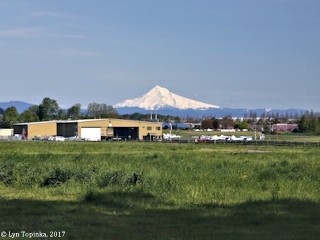 Click image to enlarge Jack Murdock Aviation Center, Pearson Field, Vancouver, Washington. Image taken March 18, 2005. Click image to enlarge Army Air Corps, Pearson Field, Washington. Image taken October 23, 2006. Click image to enlarge Army Air Corps, Pearson Field, Washington. Image taken March 8, 2004. Click image to enlarge Army Air Corps, Pearson Field, Washington. Mount Hood, Oregon, is in the background. Image taken March 19, 2010. 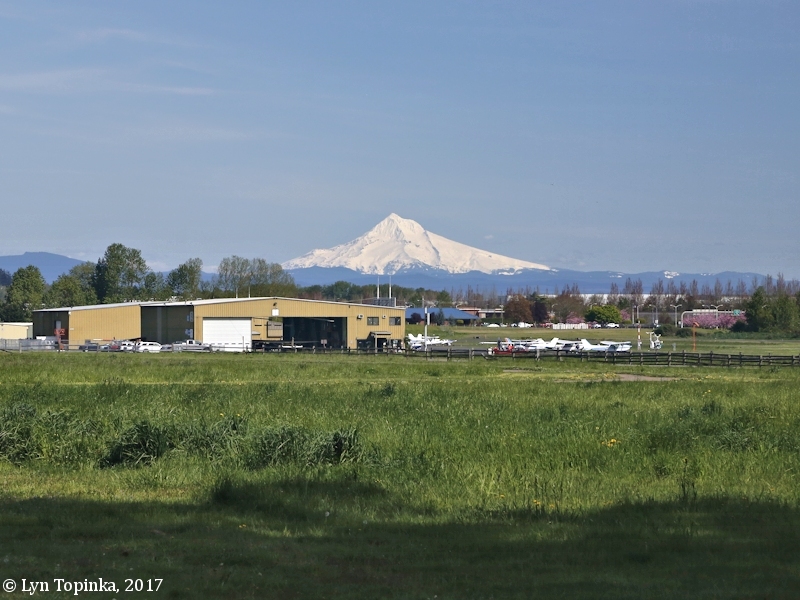 "A legacy of America's first licensed apirplane pilot is slowly taking shape inside a Vancouver warehouse. 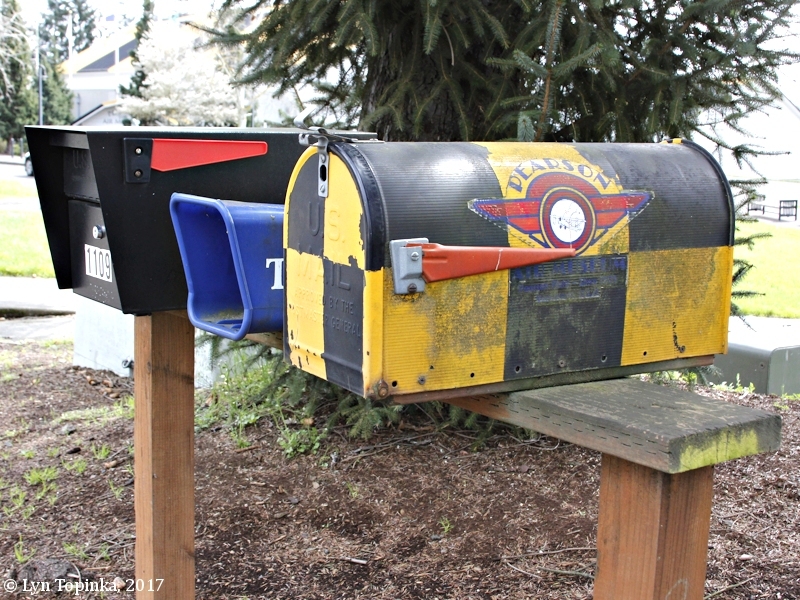 The project is a full-sized replica of a 1912 Curtiss Pusher biplane -- an aircraft that made Northwest aviation history 105 years ago when Silas Christofferson flew from the roof of the Multnomah Hotel in Portland to Vancouver Barracks. It is a fitting destination, since the area around the museum grounds is pretty much where Christofferson ended his 12-minute flight on June 11, 1912. There are no original Pushers they could duplicate, team leader Mike Daly said. So when team members started in the spring of 2016, they relied on plans that had been part of an earlier project, a scale model of the Pusher several team members helped build for the museum. ..."
Source: Tom Vogt, Columbian Science, Military & History Reporter, Published November 27, 2017, retrieved from "Columbian.com" website, December 2017. Click image to enlarge Mural. Pearson Air Museum, Vancouver, Washington. Image taken April 8, 2017. The Spruce Mill, also known as the "Cut-Up Plant," was built in 45 days and covered more than 50 acres. At peak, it was producing a million board feet of lumber every 24 hours for Allied airplane manufacturers. This HO scale (1/87) model is a replica of the mill as it looked during the summer of 1918. 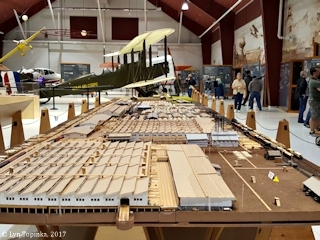 National Park Service volunteer Dr. Gary Brooks donated 1,200 hours to research and build this model, based on historic records, photographs, and maps. On this map, Spruce Mill buildings and rail lines are shown in blue. Modern buildings and landscape features are outlined. Your current location is marked with a yellow triangle." Source: Spruce Mill Model information sign, Pearson Air Musueum, visited April 2017. 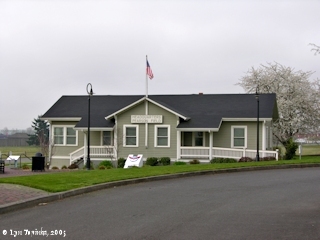 Click image to enlarge Sign, Spruce Mill Model, Pearson Air Museum, Vancouver, Washington. Image taken April 8, 2017. 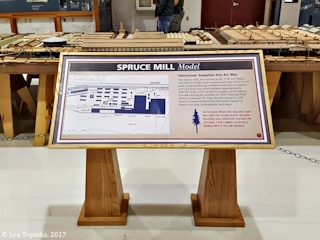 Click image to enlarge Spruce Mill Model, Pearson Air Museum, Vancouver, Washington. Image taken April 8, 2017. Alley, B., 2006, Images of Aviation, Pearson Field, Pioneering Aviation in Vancouver and Portland, Arcadia Publishing.